In San Antonio, Spurs Beat The Heat Twice In One Game : The Two-Way The air conditioning in San Antonio's arena broke down, leaving the host Spurs and the Miami Heat sweating in 90-degree temperatures as the NBA Finals began. 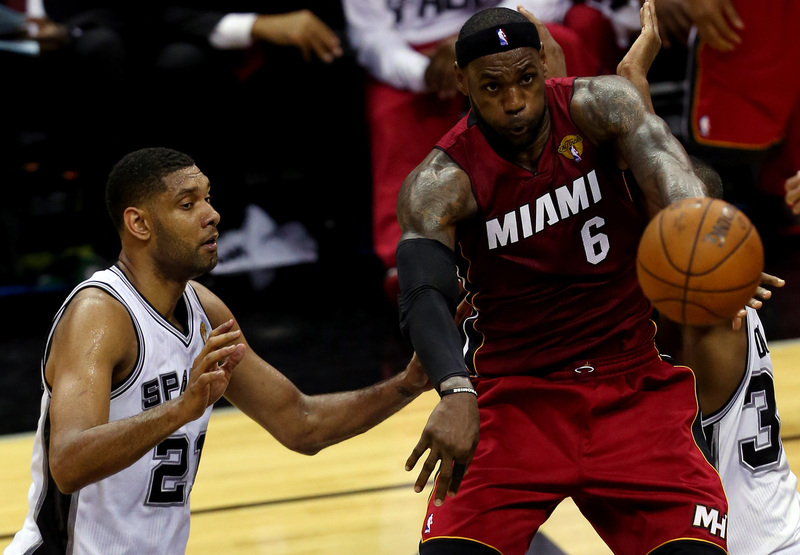 LeBron James and the Miami Heat couldn't handle the heat in San Antonio, as Tim Duncan and the Spurs took the first game of the 2014 NBA Finals. The air conditioning in the Spurs arena didn't work during the game. The first game of the NBA finals was a scorcher. Yes, it was played indoors – but the air conditioning in San Antonio's arena broke down, leaving the host Spurs and the Miami Heat sweating in 90-degree temperatures. The Spurs overcame the heat, and the Heat, 110-95. Miami star LeBron James was unable to play late in the fourth quarter, as he was hobbled by severe cramping. James finished with 25 points in a loss that saw him join Michael Jordan and Kobe Bryant as the only players in NBA history to rack up 4,000 points, 1,000 rebounds and 1,000 assists in the playoffs. The Spurs' Tim Duncan led his team with 21 points and 10 rebounds. And in the fourth quarter, San Antonio more than doubled the Heat's point total, putting up 36 to Miami's 17. The gap widened dramatically after James left with around four minutes remaining. "It was tough on both teams," Spurs coach Gregg Popovich said after the game. "They were pretty dead. We tried to get guys in and out. ... It was really hot out there." "The Spurs said an electrical failure for the power that runs the air conditioning system had occurred. They apologized for the inconvenience but also seemed to poke fun of it, playing songs with 'hot' in the lyrics over the sound system." "The best option for me to do was not to move," James said after the game. "I tried, and any little nudge or step, [the cramping] would get worse. It was the whole left leg ... [nearly] the whole left side. ... I drank a lot [of fluids] at halftime. I even changed my uniform." The Spurs weren't the only ones having a bit of fun with the outage. On Twitter, several fans called the game a hot mess and said the Heat "can't take the heat." "I'm sure that both teams are going to be happy that we have a couple days [off], and hopefully we can pay our [AC] bills," Popovich said, according to ESPN.